Fabio strengthens, at 200 PM PDT / 2100 UTC the center of Tropical Storm Fabio was located near latitude 14.2 north/longitude 108.3 west. 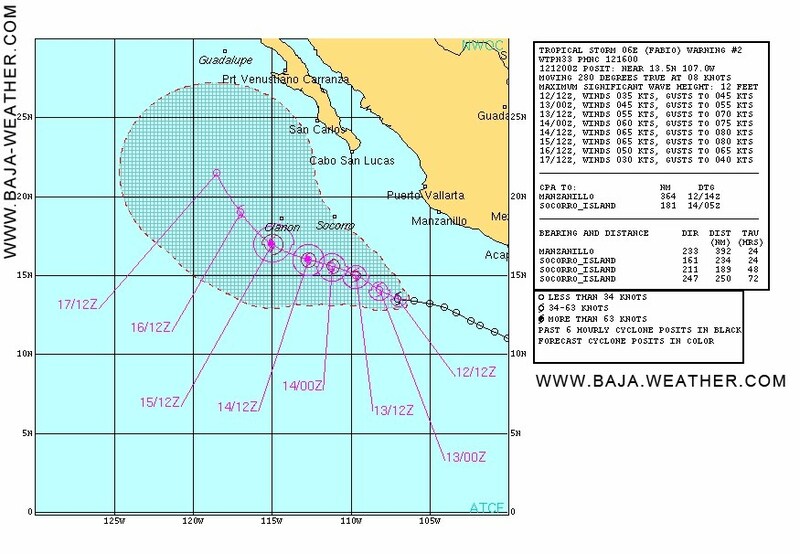 Fabio is moving toward the west-northwest near 10 mph - 17 km/h and this general motion with a slight decrease in forward speed is expected over the next couple of days. Maximum sustained winds have increased to near 50 mph - 85 km/h with higher gusts. Additional strengthening is forecast during the next 48 hours and Fabio could become a hurricane by Friday night or Saturday. Tropical storm force winds extend outward up to 60 miles 95 km from the center.